The article analyses the changes in production and consumption in the audiovisual industry and the way the so-called ‘ephemeral’ commissioned productions are scarcely preserved. New technologies and the liberal economic policies and internationalisation changed the media landscape in the 1980s. Audiovisual companies created a broad range of products within the audiovisual industry. This also resulted in a democratisation of the use of media as well as new formats of programmes and distribution for commissioned productions. By looking at a specific company that recently handed over a collection to the Netherlands Institute for Sound and Vision, challenges and issues of preserving video and digital and interactive audiovisual productions are discussed. Agterberg, B. (2014). 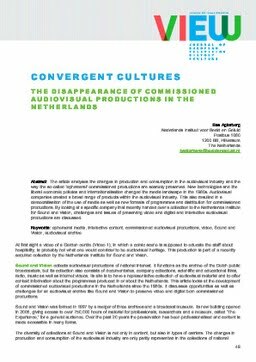 Convergent Cultures: the Disappearance of Commissioned Audiovisual Productions in the Netherlands. VIEW, 3(6), 49–57.